Performers include: John Simm, Philip Glenister, Liz White, Dean Andrews, Marshall Lancaster, Noreen Kershaw, and Tony Marshall. While investigating a serial killer in 2006, Detective Chief Inspector Sam Tyler (John Simm) of the Greater Manchester Police is hit by a speeding car. Sam awakens in the year 1973 as a recently transferred inspector at the same station. Is he crazy, in a coma, or actually a time-traveler? While searching for a way to return home, Sam tries to come to terms with the old-fashioned technology and attitudes of the 1970s. He works under the command of old-school Detective Chief Inspector Gene Hunt (Philip Glenister) and begins to develop a relationship with Detective Annie Cartwright (Liz White). 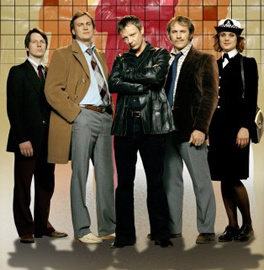 Others in the station include jealous and sexist Detective Sergeant Ray Carling (Dean Andrews) and young, naive Detective Chris Skelton (Marshall Lancaster).